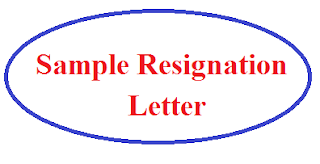 When you happened to leave a company / institute / organisation, you are required to write a resignation letter . 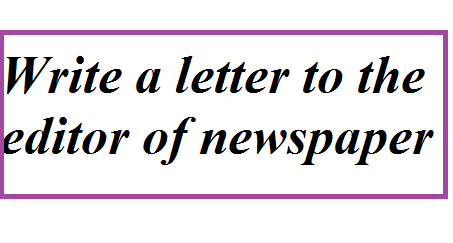 The letter should be simple, focused and to the point. You don't need to elaborate the reason for your resignation of your position / job. Also it is important to write the letter in a professional way and submit it to the concerned authorities atleast 2 weeks or one month prior to your date of leaving. This is very much key point for both employer as well as for you. The employer will find a suitable candidate for your position within that period so that the work in the concerned department will not interrupted / pending. Another important point you should in mind while writing resignation letter is don't write your frustrations about the company or co-worker or manager or any other person. You should be polite in your resignation letter as this is the final record and may be given as a reference in future. Here is the sample letter and you should make sure to rewrite the letter to fit for situation. I am writing this letter to inform you that I am resigning my position as Senior Project Engineer with effect from 31st December 2017. This date will be the last working day for me in your company. I would like to thank you for giving me the wonderful opportunities for professional and personnel development for the past 7 years. I have really enjoyed working with your concern and every staff member of the company. If I can be of any help during this transition, please let me know. I can be reachable at any time through my mobile phone which is given below. Note: Even if you have discussed your resignation with your manger, still you need to formally write a resignation letter for safe and easy transition from your position. Make this resignation letter format useful by writing it for your situations and need. Thanks for coming up to read this letter and hope you find many other resources in our website howtoletter.com are useful . There are many situations for which application letters are written. Most important one among them is writing application letter when applying to a job. Few other important tasks are applying for a scholarship, business related writings, bank letters etc. 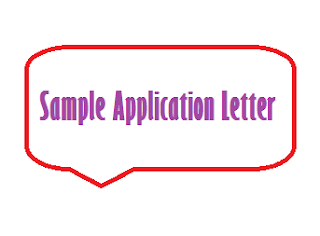 You should write application letter with utmost care and should convey the meaning of the letter in a positive manner. That is, you should convey what you want to say / request. Before going to the letter format, learn some important tips over here for writing beautiful / professional application format. 1. Application letters should be drafted carefully avoiding any grammatical errors and other related errors. 4. Content in the letter should not be over lengthy. It should be short and precise. 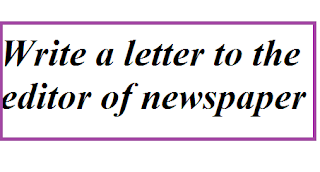 When you are going to apply for a job, then how should your letter be ? Here is a sample letter format for applying to job. Recently when I was searching for job, It happened for me to see your advertisement for the post of _______ <Write the name of post here> in ___________<name of department> dated________ <Write the date of advt here> . I am really interested to apply for the same. I have done my UG degree in _____ <subject / department> from the _______ <Write the name of college / university here>. I am fresher and yet to start my career. I am sending copies of my educational qualified certificates including my resume for your perusal. I am aware that your ________ <Write the name of organization> has a good reputation in the society and I want to become a part of this prestigious company / institution. If given a chance I shall put in all my effort to excel in the job and bring laurels to the industry / company you concerned. It happens that several functions are being conducted in a college. Some special guest / speaker will be invited as chief and he / she will deliver welcome address. There are several events for several purpose. The chief will be invited to the college with a request letter submitted to the concerned person. Some colleges will call chief guest for their conference at National Level or International Level. Some may call for their annual day function or sports day event. Graduation day function is also an important event for which chief guest will be called. 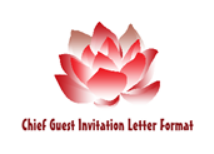 If you are the one who arranges a function and needed to call a chief guest through a request letter inviting him / her, then the letter format provided below will be more helpful to you. Assume that your college is going to conduct annual day in the year 2017-18. You are required to invite a chief guest. Below is the sample format of letter to write. I am from _________ [Your College Name here]. I am the Principal representative for our college events. Our college is going to conduct its annual day on ________ [Write the date of function here]. In this connection, we cordially invite you to our 23rd annual day and make it as special day for our college students / staff / management. We would be most honored if you can be our college day's chief guest and deliver your key note address to the gatherings. We look forward to hear your positive confirmation of our college day invitation. You can find the invitation card along with this letter. Thanking you! Note: You should use this content only as a model letter for inviting chief guest for college function or any other functions / event that you like to conduct. You should make appropriate changes wherever required in the sample letter format above. Children are the big asset of a nation. They build better future than the one before. Children day is celebrated on 14th November every year. This year, it is coming on 14th November 2017, the birth day of Pandit Jawaharlal Nehru, a leader and Ex-Prime Minister our country India. If you would like to deliver a speech on your school function / assembly, you may then take the sample speech provided below to deliver a good and effective speech. A very good morning to one and all! We are here gathered to celebrate one of the most auspicious occasion of India's festival, the Children day! This is special day for you all and me. We should proud of having the day that God given to us. This special day is meant for children. The birth day of Pandit Jawaharlal Nehru also lovingly called as Chacha / Uncle, is celebrated as the Children day of India. He showed his extreme love to all children during his life span that is why the day was converted as Children day. He always has the habit of having a rose in his pocket. So children gifted him rose. When we see rose, we will think of him. Also the rose is the symbol of love that is why lovers are using the rose to gift to his / her lover. Looking at the history of uncle Nehru, he was born on 14th November 1889 to the couple of Motilal Nehru and Swarup Rani. His father Motilal Nehru was a famous leader and lawyer. His sister Bijaylaxmi Pandit was also a great diplomat of our country India. His daughter Indira Gandhi was our first woman Prime Minister. He is also one of the freedom fighters of our nation against British Govt. He was kept in prison during the freedom fight. From the jail itself, Chacha / Uncle Nehru wrote a letter to his daughter Indira. The letter is popularly known as "Letters from a Father to His Daughter" . It is worth reading. We all must read this book apart from our regular text book and other books of story. We can buy this book or read from local library / school library. If it is not available in the school library, our respected Principal should consider bringing this book to the school library as soon as possible. He wrote many other books too. On this day, we should take oath to take care of our beloved children by showing them great love. We should direct our children to grow up in right direction with love. Let's all love the children, save them and build the way to create bright future for India. Jai Hind! Thank you all! 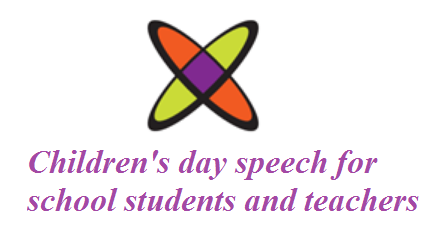 Would like to watch a video on sample speech for Children's Day 2017? Then you can watch here below!